I thought I was going to get a small pocket knife but it was bigger than expected. Beautiful craftsmanship and so unique. My husband loves fishing and hunting so this was the perfect x-mas gift !! Pleasantly surprised at how handsome and well made this pocket knife is. In heft and size, however, it is definitely more for a male if being carried in a pocket. 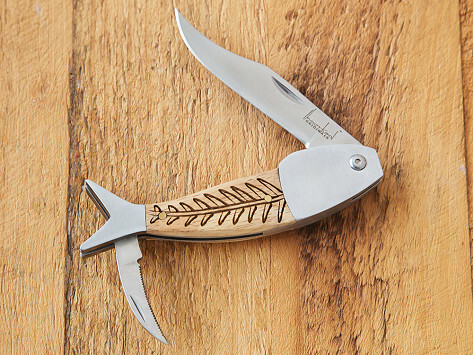 Any angler would be proud to carry this knife and pleased to find the sharpness and functionality of the blades. 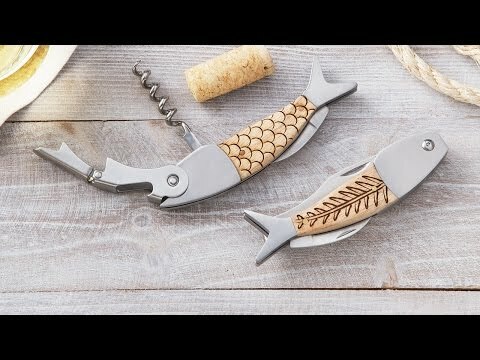 Sterling Brooke created a unique wine opener as a gift for her husband. It grabbed so much attention, the couple began making corkscrews and pocket knives to share their distinctive eye for useful (and beautiful) goods. Their pieces are guaranteed to last a lifetime. Each is made with stainless steel and white oak for long-lasting durability with an eye-catching finish. And they hand-etch the oak for a subtle, fish-inspired touch that speaks to their coastal Florida roots.